Using the My RewardsTM Gold Debit Card for everyday purchases can be very rewarding! Now, it's even easier to earn more valuable items in your rewards program. Each purchase you make with the My RewardsTM Gold Debit Card, will earn you DOUBLE the points you are used to earning. Remember, 100 points is all it takes to get a gift at the first level! You may redeem right away or save your points for bigger, better rewards in the future. To view all the available rewards, log in or create an account at www.horizondebitrewards.com and click "Rewards". Misplace your card? Get a replacement quickly and easily by calling (855) 901-8327. Shop online through the rewards website and earn cash back for your purchases. More than 100 popular online shopping sites participate. Earn as much as 3.5% cash back from online merchants like Walmart®, Best Buy®, Office Depot® and more! Cash back amounts vary by retailer. If you have a Gold or Platinum Debit Card, log in to your account at www.horizondebitrewards.com and click "Shop Online" and "Shop Online Settings". If you have a Gold or Platinum Debit Card, log in to your account at www.horizondebitrewards.com and click "Shop Online". If you have a Gold or Platinum Debit Card, log in to your account at www.horizondebitrewards.com and click "My Rewards Card" and "My Area Deals". To request assistance, please call 855-901-8327. Pharmacy and Member Help Desk: (855) 901-8327. If you have a Gold or Platinum Debit Card, log in to your account at www.horizondebitrewards.com and click "My Rewards Card" and "Rx Savings." To request assistance, please call (855) 901-8327. To request assistance, please call (855) 901-8327. For additional information on the benefits available, please click here. If you have a My Rewards Debit Card, sign in to your account at www.horizondebitrewards.com and click "My Rewards Card" and "Hotel/Car Discount Codes". Using the My RewardsTM Platinum Debit Card for everyday purchases can be very rewarding! Now, it's even easier to earn more valuable items in your rewards program. Each purchase you make with the My RewardsTM Platinum Debit Card, will earn you TRIPLE the points you are used to earning. Remember, 100 points is all it takes to get a gift at the first level! You may redeem right away or save your points for bigger, better rewards in the future. Shop online through the rewards website and earn cash back for your purchases. More than 100 popular online shopping sites participate. Earn as much as 5% cash back from online merchants like Walmart®, Best Buy®, Office Depot® and more! Cash back amounts vary by retailer. With the My RewardsTM Platinum Debit Card, you'll earn DOUBLE rewards points when you shop online through the rewards website. With more than 100 popular online shopping sites, earning bonus points has never been easier. If you did all of your shopping online, imagine how close you could be to an iPod®, a plasma TV, a Caribbean Cruise, or even a new car! Bonus points amounts vary by retailer. Access to a convenient short-term loan is easier than ever! You may be eligible to have instant access to cash to help you manage unexpected expenses. There are no hidden fees and no down payment required. Subject to program criteria guidelines. If you have a Platinum Debit Card, log in to your account at www.horizondebitrewards.com and click on "My Rewards Card" and "Loans". If you have a Gold or Platinum Debit Card, log in to your account at www.horizondebitrewards.com and click "Rewards". Using the My RewardsTM Business Platinum Debit Card for everyday purchases such as fuel, business meals and office inventory can be very rewarding! Now, it’s even easier to earn more valuable items in your rewards program. Each purchase you make with the My RewardsTM Business Platinum Debit Card will earn you TRIPLE the points you are used to earning. Remember, 100 points is all it takes to earn a gift at the first level! You may redeem right away or save your points for bigger, better rewards in the future. 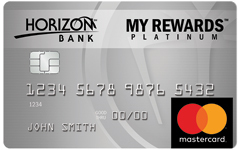 If you have a Gold, Platinum or Business Platinum Debit Card, log in to your account at www.horizondebitrewards.com and click "My Rewards Card" and "My Area Deals". If you have a Gold, Platinum or Business Platinum Debit Card, log in to your account at www.horizondebitrewards.com and click "Shop Online". Pharmacy and Member Help Desk: 855-901-8327. If you have a Gold, Platinum or Business Platinum Debit Card, log in to your account at www.horizondebitrewards.com and click "My Rewards Card" and Rx Savings"
To request assistance, please call 855-901-8327. For additional information on the benefits available, please click here. 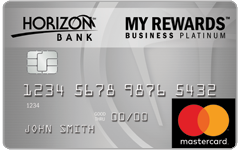 If you have a Business Platinum Debit Card, log in to your account at www.horizondebitrewards.com and click "My Rewards Card" and "Hotel/Car Discount Codes". If you have a Gold, Platinum or Business Platinum Debit Card, log in to your account at www.horizondebitrewards.com and click "Rewards". Misplace your card? Get a replacement quickly and easily by calling 855-901-8327. If you already have a www.horizondebitrewards.com account, please log in and select Card Settings from the My Rewards Card menu.